Valentin Louis Georges Eugène Marcel Proust was born in Auteuil, France 1871.Today is the 141st anniversary of this birth. Not, I fear, a very elevated one. I really haven’t the courage to say what it is, and if I did I should probably destroy it by the mere fact of putting it into words. Who are your favoite poets? For more on the Proust questionnaire and to see one he took when he was a child click here. 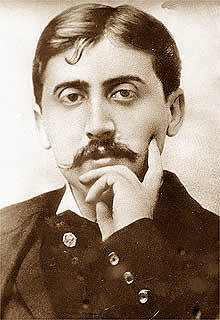 This entry was posted on Tuesday, July 10th, 2012 at 1:46 pm	and tagged with France, Marcel Proust and posted in Fiction, postaday, Proust, Thought of the Day, Today's Birthday, Writing. You can follow any responses to this entry through the RSS 2.0 feed.